Successful concerts with Petra and a searing ICC-distributed album didn't quite prepare Tony Cummings for his memorable encounter with the music and ministry of JERUSALEM. I stand in a field at Flevo festival, at the back of a crowd, watching 7,000 or 8,000 people pray. From the Flevo festival stage Ulf Christiansson, the guitarist, songwriter and singer with Sweden's premier Christian rock band Jerusalem, prays for those who, moments before, had raised their hands acknowledging that they wanted to become Christians. Jerusalem have returned to the Christian music arena having more-or-less quit in 1987. Before that they were pioneers for both Christian rock in Sweden, being that country's first Christian rock band, and Christian heavy metal where they gained worldwide release with such albums as 'Warrior', 'Live In The USA' and 'Dancing On The Head Of The Serpent'. But while glittering prizes from America's hyped-up Christian rock scene beckoned, the members retreated to the Word Of Life church in Uppsala outside Stockholm. Ulf Christiansson made occasional musical sortees (the praise orientated solo album The Lifestyle From Above') while he preached at churches throughout Sweden. The other band members worked with music in different ways at the church in Uppsala. In September 1993 the band moved with their members from Uppsala to Gothenburg. "It's like coming home again," Ulf told journalist Steffan Gustafsson. "The pastor at the church we go to is an old friend of mine, and it's great to have a church that's behind you one hundred per cent. Gothenburg is my hometown and I'm very happy to be back." In 1993 the revitalised Jerusalem, Ulf Christiansson (vocals, guitar); Reidar I Paulsen (keyboards); Peter Carlsohn (bass); and Michael Ulvsgard (drums) went into a recording studio. They had no songs and no idea as to what the results might be, only a passionate belief that the Spirit was going to bring them songs and ideas. He did. 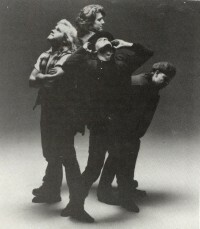 The resulting album 'Prophet' contains at least one number that went on to tape direct from the band's Spirit-led jam. I'm speaking to a record executive. It's past midnight; we're both dog-tired and are awaiting transport to take us off the Flevo festival site. He tells me he isn't a charismatic but a strange experience had happened to him a couple of hours before. "I went into the dressing room just before Jerusalem were about to go on stage. They were praying. There was such a sense of the presence of God in that room that tears started to come to my eyes." The question Jerusalem have been asked over and over again since their "comeback" and their successful European tour with Petra is 'What made you decide to get together again and play after seven years?' "The vision of Jerusalem and the calling have never died," said Ulf Christiansson. "But we wanted to put it down totally and let God pick it up. If he didn't, it would be over. Then, in April 1992, I felt that I had to get out to the people again. I felt clearly how God spoke to me and I prayed over it for a long time before I got the other members together in December the same year. I didn't know if all would be in, but I knew that Jerusalem would be back. Even though the band members haven't been together that much in Uppsala, I got a unanimous response from all, including wives and children, which I see as somewhat of a miracle after all these years. There's a tremendous need for bands to stand up and do what we do. We also feel it's our mission - what God set us out to do. I don't see it as a nostalgia trip. The whole thing feels very new and fresh. Some people were kind of concerned that we would be all mellow now playing some kind of country music, but we have moved forward. I don't think we would have made a comeback if we didn't feel we had anything new to come up with." The title of the band's awesome comeback album is an intentional contrast to the spreaders of misinformation that bombard us in the Western world. Explained Ulf, "We decided to call it 'Prophet', because today there are so many self-proclaimed 'prophets' trying to manipulate you through music, New Age, television and so on. We live in a time of great confusion. We want to point out that the only truth and the only prophet is Jesus Christ, and that's something humanity really needs to get back to. 'City On Fire' is about a city that starts to burn and you can see the fire from a distance, how it grows all the time. Then I sing that it's not an ordinary fire. It's another kind of flame and when you come close the fire will start burning in you. It's about having the fire of the Holy Spirit. Truth' is [based] around the concept of the album title. It's about Jesus being the only truth and you have to stick to the truth. 'Next Year In Jerusalem' is about a Jewish guy growing up in Berlin in the 1930s. He meets a girl and they get married and have two kids. One day the Gestapo comes and takes them away. It's very strong and emotional and clocks in over nine minutes. "'Soldier' is about us being soldiers. It's not really about warfare. It's kind of soft and gentle. 'Waiting Zone' is about AIDS, where society tries to deal with the problem from the wrong end. They seem to believe that all we have to do is educate people and the problem will go away. We have to deal with the problem where it starts. Our lifestyles are what has created this problem, which is something nobody talks about. "The first single, 'Tomorrow', is about Christ carrying the cross to Golgotha. The single has a bonus track called 'Coming Down', about a guy lying helpless on the street and how we as Christians try to help him in different ways. [But] it's not until we come down from our high horses and to his level that we can really help him. There's kind of two sides to this story: 'He was living far above, but he came down to save us.' That's how we as Christians should be. Our purpose is to come with the message that Jesus is alive and that he can change people's lives. Most people you can't reach with slogans and Bible verses. It takes more engagement - both social and spiritual - more heart and commitment to those you want to reach. Jesus had that and it was something that the Pharisees always attacked him for." In interviews the band talk about a new music. But what is this new music? "A new heart. I believe it's basically more about motives than music styles. We are here to glorify God, not ourselves. I'm not trying to put anybody down, but I believe that we as Christians have never really been ready to pay the price in full. As Christian musicians we have sometimes been too concerned seeing what is popular and following the trends. I don't think you can take the Guns 'N' Roses sound and put Jesus in it. It is to go the wrong way - and then I'm not talking about music styles. I'm talking about the inspiration source. If we really want to win the world for Jesus with music, we must have God as our main inspiration and not let a specific band or sound be what we build our ministry on. I think God is very modern and creative and that he has something new to give musically as well. But then we must seek him first, not the other way around. "We have done our thing and we have had good intentions. I don't question people's motives and intentions, but I believe that there is a deeper dimension in really being called by God. And that is something I have personally learned over the last couple of years. To be called by God as a musician is something to take very seriously. It's just as serious as being called to be a missionary or a pastor. I think we really have to come to terms with ourselves, why we do it. If we just do it because we think it's cool and we like heavy metal or whatever, we're really doing it for our own purpose. In John 12:24 Jesus says, 'I tell you the truth, unless a kernel of wheat falls to the ground and dies, it remains only a single seed. But, if it dies, it produces many seeds.' I believe every Christian has to go through such a process - whether they are musicians or not. It's a very painful and hard process. The process is about getting to the point where you don't care if you play in a rock band or doing your thing, whatever it is. The only thing that matters in your life is your relationship with God. Then we'll have a potential that's enormous; and we let God work from there. We have to ask what God wants in our life. Then we'll have the new music, a music that's very powerful spiritually. Then what we shall have in Christian concerts is power - the power of God - and it can be manifested in so many ways. Where people literally can see God's power... We have to learn to listen to what the Holy Spirit says. Sometimes it can tell us to be quiet, and sometimes to witness very intensely. I believe that testimony is important. We must use the platform God has given us to glorify him, not ourselves." I've done hundreds, no, thousands, of interviews down the years. And at Christian events large and small I've done many public interviews asking celebrities, usually musicians, what they're doing, what they think about this and that while a crowd looks on. But this one is different, very different and my mouth is dry and I feel my stomach turning somersaults. I'm interviewing Jerusalem in the Dorpskerk (a round wooden building that looks like a beer hall) at the Flevo festival. The place is literally packed to the wooden rafters. But it's not the size of the crowd. Nor any potential language problems - the band's Swedish, the crowd's Dutch, I'm English - that makes me nervous. It's the fact that the Lord has spoken to me before the interview and told me not to ask standard music questions ("Tell me about the new album", "Why the change of style from metal to something more U2-ish? ", "What are your plans for the future?"). The Lord has told me he'll lead the questions as he directs. So with each question a silent prayer from me goes up that I'll know what I am to ask and where I am to direct this conversation. It's terrifying, I feel one step away from looking like an unprepared, incoherent fool. But I blurt out questions. We talk about salvation, a deeper experience of the Holy Spirit, abandoning everything for the sake of the cross. I feel a sense of the presence of God. Many do. Afterwards the band are enveloped in a throng of fans, searchers, Christians. I leave my most nerve-wracking interview elated and exhausted. Ulf Christiansson is optimistic about the potential for Christian music to make a profound impact on our culture. "I think record companies are not as reluctant towards Christian bands anymore. People are more interested in spiritual things now - both in a positive and a negative sense. I believe Christian music will have a much more powerful impact in the world than it has had before, but it will not happen until we've realised the need of accountability (the church and the rest of the body of Christ) and submit to what God has called us to do. Of course, we shall have the freedom to do what we have in our hearts, but we need to start at the right end." So, there you have it: the band is going out to the people again with some heavy music, but different; with the same bold message, but with mercy and grace; with the same musicians, just a little older." I have recently started researching my old forgotten heritage I had lost. REZ, Whitecross, Jerusalem, Pastor Bob's band Deliverance ADD NAUSEAM! I am sick of modern so called Christian "worship" junk music. My gift of discernment of spirits and daily searching of scriptures makes me shudder of anything that is not pure in attitude and delivery of music, but also clearly theologically sound. Frankly I find Glen Kiser and Wendy still cleanest in delivering Love message of Jesus. Michael Bloodgood is a sinner like me, but his tenacity inspires. I found this page about Jerusalem while searching where I can purchase old stuff by ULF. New stuff by Stephen Groth of APOP is good, but I am after rediscovering heritage I lost. 51 year old refuge from what everyone forgot used to be called Yugoslavia. I need someone to help me prod and blow the flame. I firmly belive now this I also works on Church and souls of people.